In CT scanning, amalgam and other metal types with inhomogeneities cause artifacts, known as a metal streak artifacts, on the resultant CT images. Streak artifacts in CT images appear as bright and dark shadow components that spread from the metal objects. In theory, interactions between photons and higher density material produce large amount of scattered radiation compared to the usual. The high Z number material absorbs large amounts of photons and causes a signal deficiency in CT detector (photon starvation). Bright and dark streaks are formed in the reconstructed CT images due to scattered radiation and starvation of photons. Hence, due to the errors caused in the calculation, several authors have suggested different strategies in reducing the uncertainties it poses. 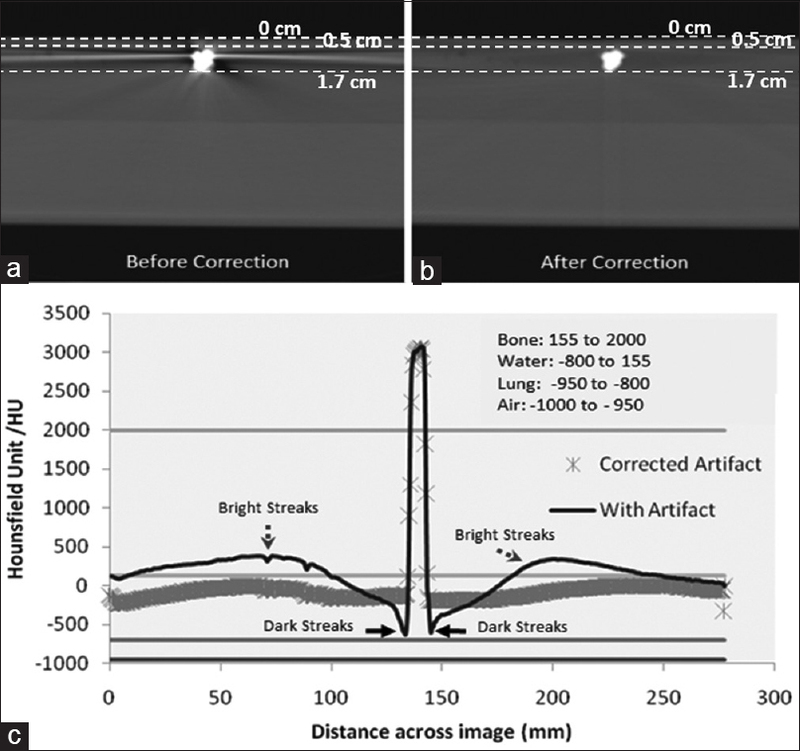 Some researchers neglect the risk of correcting images with streak artifact by manually editing dental structure to form metal structure in the images., This method has been very successful in determining the accurate dose, but it is difficult to implement in radiotherapy since it requires the patient to replace the amalgam structure with a nonmetallic structure before the treatment planning process begins. On the other hand, Myint (2008) used mega-voltage CT (MVCT) instead of kilo-voltage CT (kVCT) in acquiring the CT images as input to the Monte Carlo (MC) dose calculation. He found that the kVCT and the MVCT underestimated the dose in the high atomic number (Z) hip prosthesis by 17% and 12%, respectively. The purpose of this study was to demonstrate a strategy to reduce dose calculation uncertainties due to metal amalgam in MC dose calculation. This strategy can be applied in dose calculation whenever a primary beam needs to be directed to an amalgam material. The reduction in calculation uncertainties is a crucial component in implementing dose optimization to patients who undergo radiotherapy treatment. Phantoms containing amalgam filling were prepared for this work. The amalgam material was filled in dental with the help of a dentist to create a dental amalgam phantom. After the amalgam had completely hardened, the dental was positioned in the center of wax to form a 30 cm 3 × 30 cm 3 × 1.2 cm 3 slab, as shown in [Figure 1]. Paraffin wax (0.9 g/cm 3) was chosen as water equivalent material in this study due to its physical properties, and it is easy to mold to the desired shape or dimension. A CT scan of the phantom was carried out using a CT scanner (Siemens, SOMATOM Sensation) to gain tomographic images of every ± 1 mm thickness. From the images retrieved, the amalgam was observed to cause a significant amount of streak artifacts in reconstructed images. These images were further analyzed and processed to eliminate the streaks. Next, the phantom was irradiated with a single electron beam exposure of 9 MeV from Siemens Primus Accelerator, using a 10 × 10 cm 2 applicator in size and the source to surface distance was 100 cm. The data were used to benchmark the MC calculations on streaked samples and corrected samples. An algorithm implemented in MATLAB was developed to eliminate metal streak artifacts from CT images. The workings of the implemented work started with the construction of virtual sinogram using the inverse back projection function from the affected CT sample. It is also known as Radon transforms function, which has been introduced by Johan Radon in 1917, and also known as a reverse process in CT image reconstruction. Using the segmentation technique, the higher density sinogram region (representing metal and tooth) was identified and separated from the sinogram. This sinogram was then interpolated with its neighboring pixels using linear interpolation. Later, a tomographic image was reconstructed from the interpolated sinogram using filtered back projection (FBP) reconstruction technique. The highest density sinogram region was then reconstructed separately using the same FBP technique. After that, the two tomographic images were superimposed to obtain the corrected tomographic image. Finally, the image was saved in the DICOM format with all its original metadata retained. As for quantitative analysis, the Hounsfield Unit (HU) values of the original and the corrected images were analyzed. A new LINAC treatment head model was developed using BEAMnrc, and the dose distributions in phantoms were calculated using DOSXYZnrc source code on a computer system. The BEAMnrc is an MC modeling, and the simulation system is specially designed for radiotherapy beams emitters, whereas the DOSXYZnrc is a programming tool that calculates absorbed doses in phantom or patients. Thus, in order to establish an accurate model and simulation, precise information of shape, dimension, positions, and material compositions were required. Besides, as far as this project was concerned, the treatment head component model was established based on the MC worksheet provided by Siemens Medical System, USA. Ion chamber measurement data were collected and utilized to benchmark the MC beam model and the radiation transport. The beam model was derived from BEAMnrc and had been previously benchmarked by experiments in a homogeneous water phantom. Furthermore, the beam model was also validated in heterogeneous dental phantom using film dosimetry technique (Kodak EDR2) at 0 cm, 0.5 cm, and 1.7 cm depths. 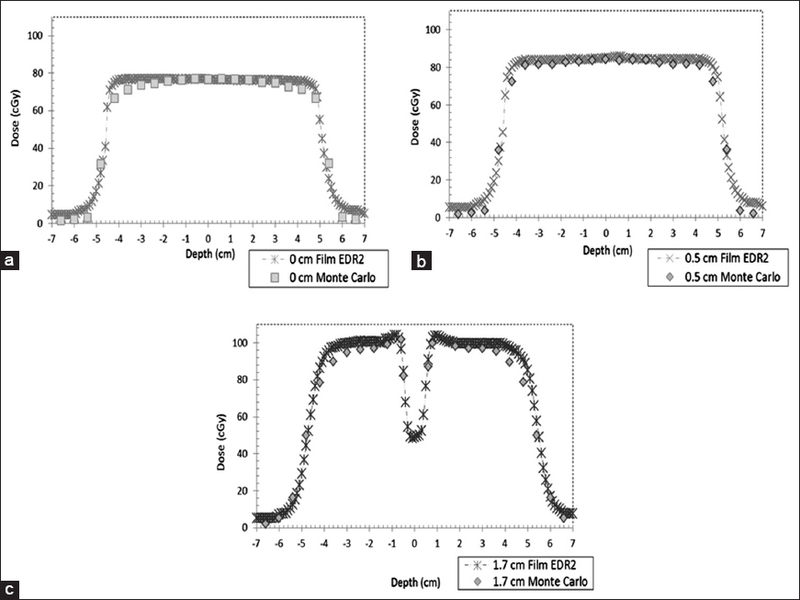 Film dosimetry has also been used as a measurement method by several authors in benchmarking MC model calculation on heterogeneous media., Moreover, with proper handling, film dosimetry can provide remarkable results with more straightforward use. A 3-D CT data set consisting of 300 CT images with 1 mm slice thickness was used in the whole process of dose calculation. The dose was calculated based on density ρ, for every voxel in the image in DOSXYZnrc calculation. In DOSXYZnrc, 6.0 × 108 particle histories were used to simulate the electron transport in this calculation. The doses from images with streak artifact and images corrected from streak artifact were calculated independently. Finally, the results were further analyzed and compared with the measurement data using Kodak EDR2 film using dose error. The beam model calculation was validated by measurement on inhomogeneous dental vicinity using radiographic film (Kodak EDR2). The profiles of the doses were measured and calculated at three different depths (0 cm, 0.5 cm, and 1.7 cm). These are only three possible depths the data can be measured due to the limitation of dosimetry and phantom. Depths 0 cm and 0.5 cm were located above the dental inhomogeneities while depth 1.7 cm was below the inhomogeneities material. MC validation results on [Figure 2] show that our MC calculation model was able to define the doses, as measured by EDR2 with a deviation of ±2% in heterogeneous phantom. This developed model is a reliable MC model for further calculation setup since the accuracy estimation in inhomogenous setup is 98% with real measurement. The use of MC algorithm in dose calculation promised a reduction of uncertainties in a medium with heterogeneities. In metal type inhomogeneities, new source of errors due to streak artifacts were observed in the calculation. In this study, uncorrected and corrected images were compared. The comparison showed a misinterpretation in assigning voxel by streak images had led to errors in dose calculation [Figure 3]a and b]. Regions with bright streaks appeared with high HU values and were further interpreted as a high-density object (i.e., dental). As portrayed in [Figure 4], the streak artifact reduction technique diminished the bright and the dark streaks for better image quality. Besides, with the use of streak artifact algorithm, the severity of the bright and the dark streaks was reduced. By interpolating the corrupted pixel with its surrounding pixels in the water, the HU pixel was observed to be more consistent (approximately ±1 HU) in the resultant images. This further corrected all the density values in the corrupted voxels. As a result, the objects in the images could be distinguished precisely. In addition, the algorithm also provided a solution for MC calculation in defining an object sharply, as well as assigning each voxel appropriately. After every voxel had been corrected using the streak artifact reduction technique, the amalgam voxels were then segmented. This was to ensure if the amalgam voxel had the correct density value, 8.0 g/cm 3. Besides, the segmentation values are depicted in [Table 1]. Using the proposed value as maximum density value, the amalgam voxel only had a density of around 4.5–5.1 g/cm 3 as in [Figure 3]a, which was comparatively lower than the actual value (8.0 g/cm 3). Therefore, substituting the maximum density of amalgam to 16.0 g/cm 3 had resulted in the amalgam voxels to have a density value of approximately 7.9–9.2 g/cm 3 as illustrated in [Figure 3]b. This increased the accuracy of MC calculation and the dose uncertainties were reduced. In comparison to maximum HU (4095 HU), the amalgam of CT HU used in this work was approximately 2900–3100 HU. Defining maximum density of 8.0 g/cm 3 would, therefore, cause the voxels to be set at a lower density value (i.e., 4.5 g/cm 3 in [Figure 3]a). With metal inside the beam coverage, extra precaution on its density should be taken into account as it could result in a huge uncertainty in dose delivery. In clinical setting, the physicist should avoid placing beam toward position contains amalgam materials to reduce error in dose delivery since non MC based system are unable to do a correction for amalgam. CT number to electron density data in the treatment planning system should be updated for amalgam material since the highest metal available was titanium (4.5 g/cm 3). In addition, in investigating the effects of metal amalgam on MC calculation, a comparison between the distributions of the doses from the pre and the postprocessed images was conducted. 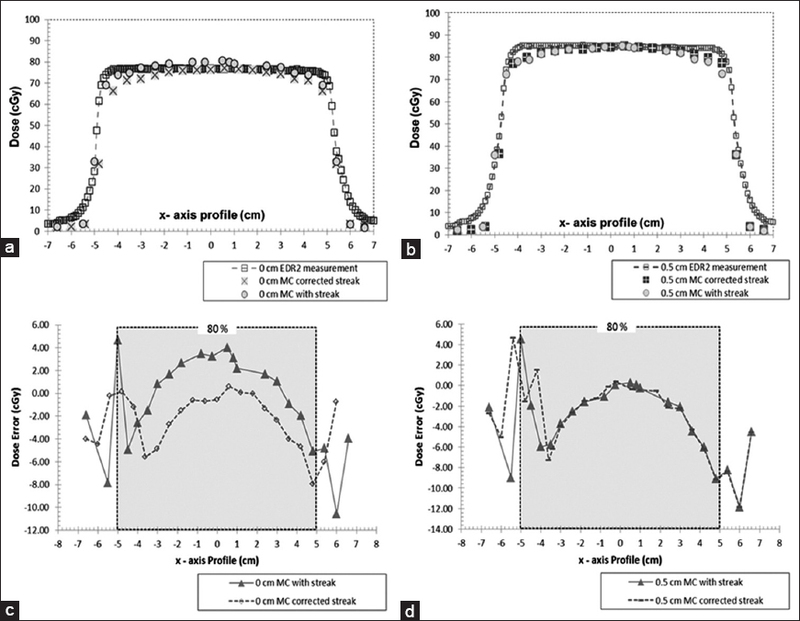 Profiles from the three different depths (0, 0.5, and 1.7 cm) are compiled in [Figure 5] and [Figure 6] to estimate the magnitude of dose alteration due to streak effects in MC calculation. As depicted in [Figure 5]a and [Figure 5]b, the dose uncertainties between the calculations of the pre and the post corrected at depth 0 cm and 0.5 cm are trivial (<2%). 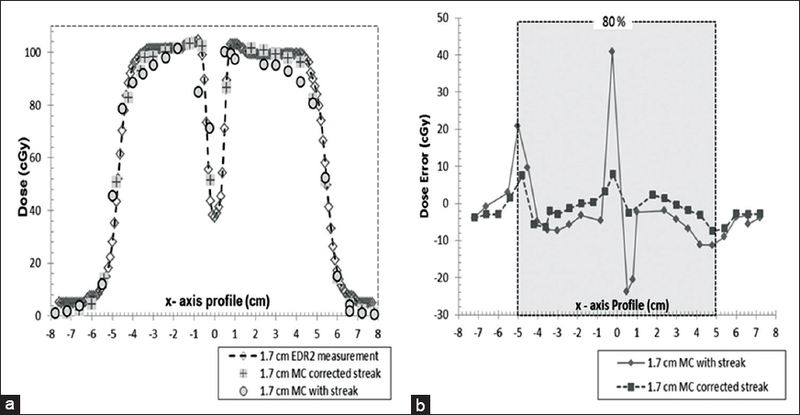 The dose errors in MC calculation were plotted on x-axis profile at depth of 80% of maximum dose, d80 (electron beam therapeutic range) for 0 cm [Figure 5]c, and 0.5 cm depth [Figure 5]d. At 0 cm, the range of dose errors was observed from −10.57 cGy to 4.71 cGy in pre corrected calculation and −7.95 cGy to 0.60 cGy for post corrected calculation. For 0.5 cm, the dose errors were observed from −11.86 cGy to 4.52 in images that contained streaks, whereas the dose errors in images with corrected streak depicted dose errors from −11.86 cGy to 4.66 cGy. Furthermore, evaluations had clearly showed that steak images altered dose in some points in dose distributions. Bright streaks caused the dose to increase while black streaks caused the dose to reduce. However, the former predominated the latter in this study. In addition, streak artifacts caused the profile to lose its contour, and it could not be predicted. Overall, as depicted in [Figure 6]a, the dose uncertainties between the calculations of the pre- and the post-corrected images were as high as 46% within the clinical target volume. In most uncorrected profiles, the field sizes of the beam were shifted from the corrected profiles. As large as 0.6 cm shift had been observed from the pre and the post corrected images. Modifications of density input due to artifacts in the images were suspected as the main reason. As the images were processed in a streak artifact reduction method, every voxel had been corrected individually by the interpolation process, and thus, assisted MC to regain its accuracy and reduced the dose uncertainties to 2%. Analysis in [Figure 6]b showed that calculation using images with precorrected images can increase the probability of dose error from − 23.82 cGy to 40.91 cGy in its therapeutic region (d80). By using the corrected images, the level of discrepancy was reduced in the range of − 6.37–7.94 cGy (±8 cGy). Even for most accurate calculation methods available, artifact uncertainties do occur, and this matter should be taken seriously. By correcting the streak artifacts on the images and correcting the density value of amalgam, the errors exerted were minimized, which consequently, increased the precision of radiation delivery. With the presence of streak artifacts in the images, one would be in doubt about the level of accuracy that can be achieved, even with an advanced calculated method such as MC. In head and neck treatment, metal amalgam has always caused problems in the dose calculation. In this study, the effects of streaks were analyzed on an MC calculation to quantify the dose errors they caused in the calculation. Through the method proposed, the errors were successfully reduced from 46% to as low as 2%. This study had demonstrated that the errors were exerted by small amalgam size energized under the electron beam. Clinically, the streak artifact reduction techniques are proposed to images affected with streak before it can be used as an input in any calculation algorithm. Instead of correcting the water density surroundings affected by the artifact, the density of the amalgam should also be considered in the dose calculation. Corrections of both factors had successfully reduced the errors exerted due to streak artifacts. The authors would like to extend their highest gratitude to Department of Higher Education (Malaysia), for providing grant under Fundamental Research Grants Scheme (FRGS) 203/CIPPT/6711341. Appreciation also goes to Advance Medical and Dental Institute Universiti Sains Malaysia, staff of Nuclear Medicine, Radiotherapy and Oncology department, Universiti Sains Malaysia, staff of Radiology department, Universiti Sains Malaysia and Siemens Medical System U.S.A.
Spirydovich S, Papiez L, Langer M, Sandison G, Thai V. High density dental materials and radiotherapy planning: Comparison of the dose predictions using superposition algorithm and fluence map Monte Carlo method with radiochromic film measurements. Radiother Oncol 2006;81:309-14. Myint WK. Dose Errors in the Treatment Planning Process of Cancer Radiotherapy Ph.D. Dissertation Charleton University, Canada; 2008. Chin DW, Treister N, Friedland B, Cormack RA, Tishler RB, Makrigiorgos GM, et al. Effect of dental restorations and prostheses on radiotherapy dose distribution: A Monte Carlo study. J Appl Clin Med Phys 2009;10:2853. Yazdi M, Beaulieu L. Artifacts in spiral X-ray CT scanners: Problems and solutions. Int J Biol Life Sci 2008;4:135-9. Bazalova M, Coolens C, Cury F, Childs P, Beaulieu L, Verhaegen F. Monte Carlo dose calculation for phantoms with hip prosthesis. J Phys Conf Ser 2008;102:1-8. Bazalova M, Beaulieu L, Palefsky S, Verhaegena F. Correction of CT artifacts and its influence on Monte Carlo dose calculations. Med Phys 2007;34:2119-32. Hsieh J. Computed Tomography Principles, Design, Artifacts and Recent Advances. 2nd ed. Washington, USA: John Wiley and Sons; 2009. Abdul-Aziz MZ, Yusoff AL, Salikin MS. Monte Carlo electron beam dose distribution near high density inhomogeneities interfaces. World Acad Sci Eng Technol 2011;58:338-41. Chow JC, Grigorov GN. Dosimetric dependence of the dimensional characteristics on a lead shield in electron radiotherapy: A Monte Carlo study. J Appl Clin Med Phys 2009;10:2918. Khan F. The Physics of Radiation Therapy. 4th ed. Philadelphia, PA: Lippincott, Williams and Wilkins; 2010.